Rocky Mountain Flycasters Chapter of Trout Unlimited presents its annual Fly Tying Expo Wednesday February 20th. Two dozen top guides, authors and designers will demonstrate their techniques and favorite patterns. 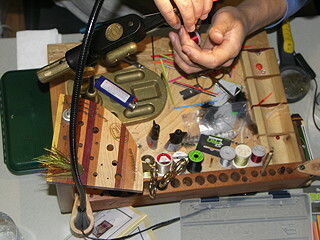 A beginners bench will offer those who ‘have always wanted to try that’ the opportunity to create their own first fly. Doors open at 5:30 pm. A meal, catered by Canino’s Italian, and raffle entries are included in ticket price: $20.00 adults, $10.00 students with ID, under 12 free. Funds raised support chapter conservation and education projects, including restoring the fishing pier on the Big Thompson River, greenback trout restoration in the upper Poudre Basin, and the annual Teen Conservation and Fly Fishing Day Camp.